25hrs and 43min, the time period between 6:46a Sunday May 14, 2017 (when my flight touched down) to 8:30a Monday May 15, 2017 (when my return flight took off). 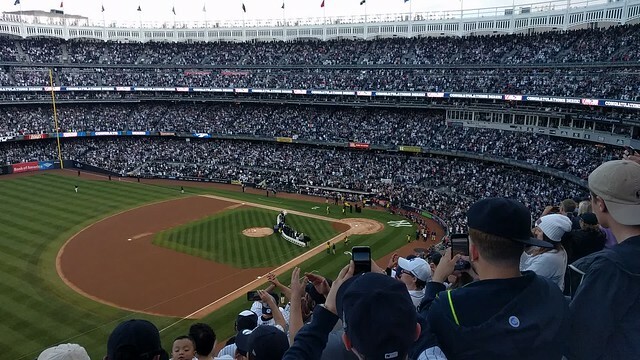 Witnessing the ceremony to retire Derek Jeter’s #2 occupied a portion of time around 6:35p +/- travel time to and from Yankee Stadium, but what about the rest? Traveling alone with a small bag afforded a great deal of flexibility but many places did not open early on Sunday, limiting my pre-10a options. Arriving in JFK and relying on the subway meant traveling through Brooklyn to get to Manhattan and then the Bronx. 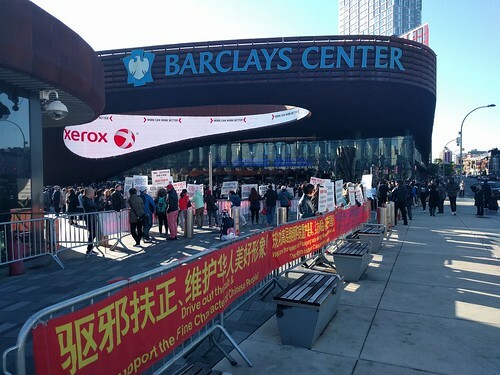 My chosen path took me past the Barclay’s Center…hosting a Falun Dafa get together along with protesters. 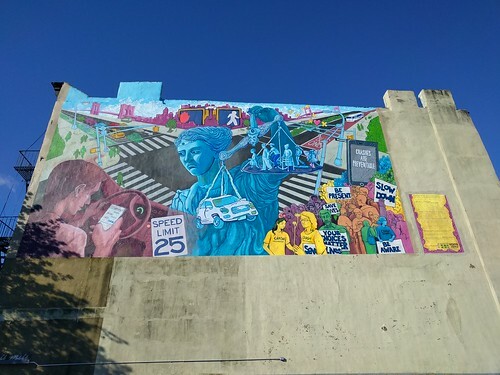 Justice At The Crossroads greeted me at the start of my 2mi walk along 5th Ave through the Park Slope neighborhood. 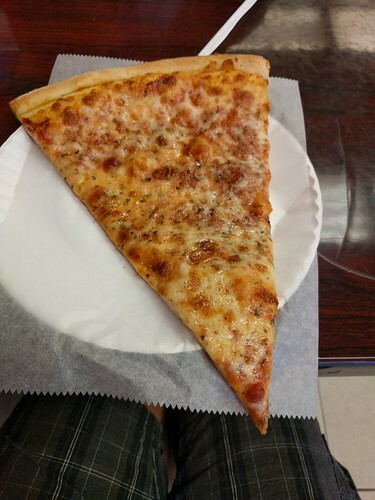 Not many establishments open before 9a on a Sunday and I wanted something I could eat for breakfast while walking, which lead me to Bagel World. The bagel itself did not impress, though the bacon and chive cream cheese made it worthwhile. 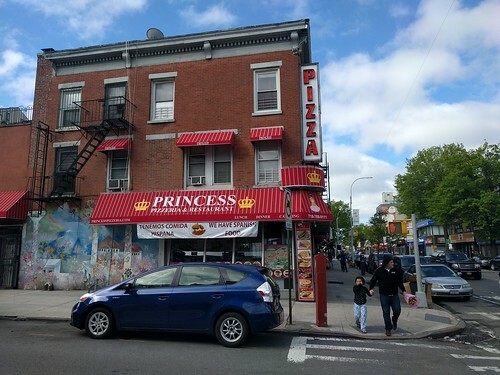 At the start of my walk, the pizza places I passed by touted brick ovens or wood fires, but as I left Park Slope, the advertisements changed. Eventually my destination came into view. 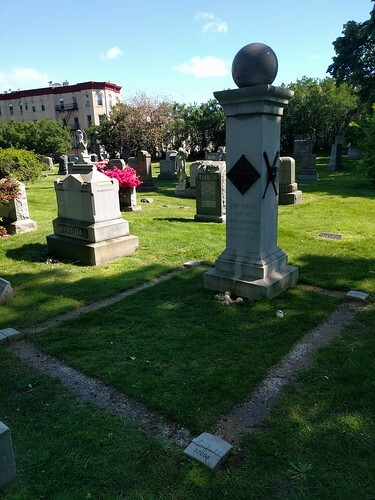 Green-wood Cemetery contains the graves of Henry Chadwick the “Father of Baseball” and Charles Ebbets who orchestrated the construction of Ebbets Field, home of the former Yankees’ rival Brooklyn Dodgers. Not only did that align with the baseball theme of my trip, but my dad mentioned a noteworthy sculpture, Triumph of Civic Virtue i.e. Naked Man Trampling Mermaids, also called the cemetery home and fortunately it stood near the other grave markers. All three landmarks cluster along a ~1mi path from the main entrance to 20th St and Prospect Park West (as a bonus Leonard Bernstein’s grave also abuts the path). 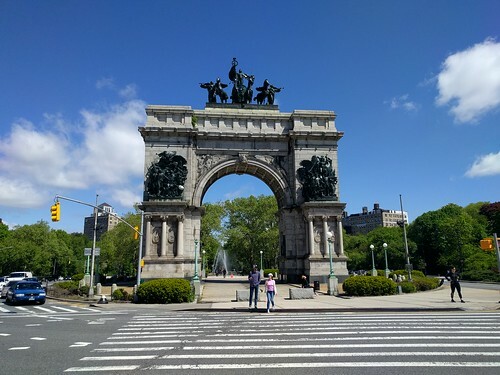 After the cemetery, I made my way to Grand Army Plaza along the west side of Prospect Park, walking briskly to arrive by 10:30a while finishing my bagel. I wanted to make a video call to my daughter to show her one of the landmarks from Knuffle Bunny Too in a feeble attempt to demonstrate the fun of traveling. The original plan for this trip was for the whole family to go to the game, visit my grandmother and perhaps other friends and family, but she does not like to travel and be away from home which makes the week leading up to the trip, the trip itself and the following week mostly miserable. I took the 3 train to Wall St. Upon exiting the subway I noticed crowds of tourists taking photos of a building. To my surprise, our current president owns it, 40 Wall St aka The Trump Building. 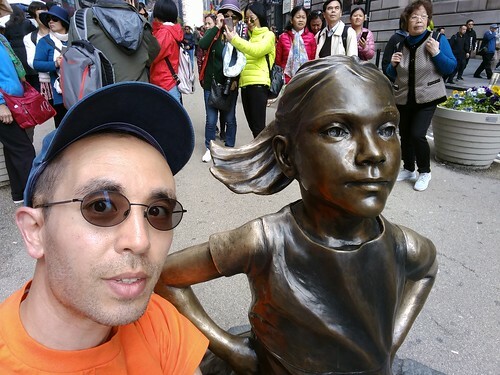 The Fearless Girl statue caused quite a stir after its installation almost 2 months earlier. 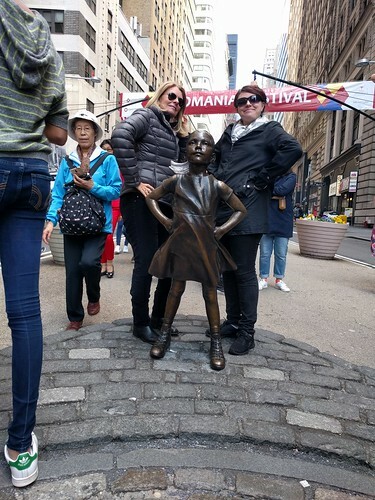 I wanted to take a photo of my daughter with the statue, but being alone I instead captured a few random tourists and after waiting a long time gave up on there ever being a break in the crowd. As sometimes happens, the Metropolitan Transit Authority’s service advisories fooled me into thinking certain trains were available at certain stations. Alas, the first three stations I attempted to enter to catch a 4/5/6 train uptown were closed. 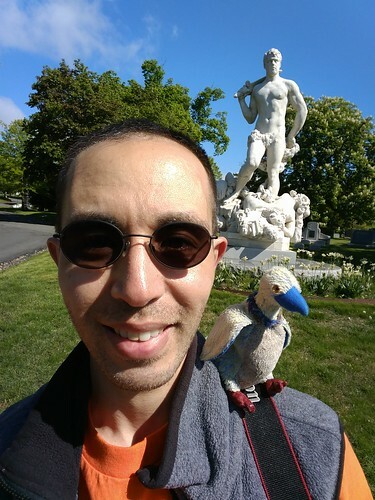 However the search caused me to pass by the statue a second time and while someone troubleshot a camera malfunction, I managed to sneak in. I ended up on the R and eventually met my dad at the Metropolitan Museum of art. 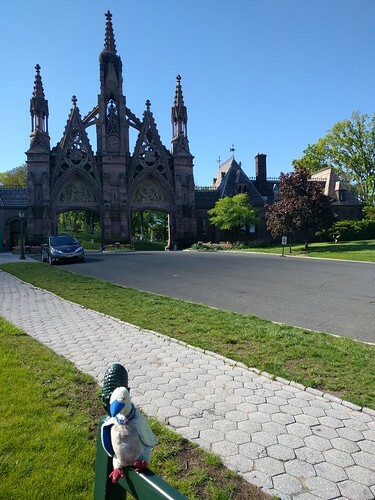 We played Ingress for a bit, each making progress towards the MAGNUS Builder Medal and then decided to head towards Yankee Stadium. At 2:38a the previous day, the Yankees sent an e-mail to ticket holders of Sunday’s game. They decided to cancel Saturday’s game due to predicted inclement weather and made Sunday a single admission doubleheader. The first game started at 2:05p, the ceremony followed (though no earlier than 6:35p) and game two began shortly after that. We decided against spending 8+ hours of the trip at the stadium, but still needed to eat some lunch. 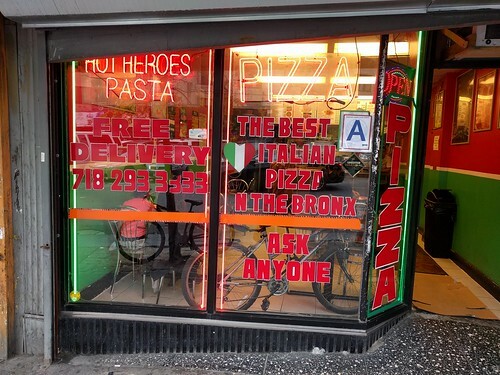 A quick search for “pizza near Yankee Stadium” turned up “167th St Pizza”. The best? It certainly tasted different, “sweet” (as in not sour, salty, bitter etc. as opposed to cool, awesome, rad). 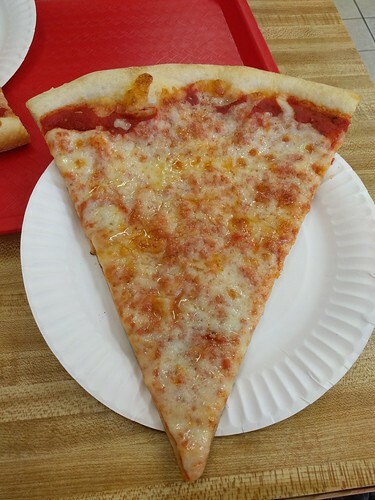 On the way back to the stadium, we passed by another pizza place, Giovanni’s and tried one of their slices. 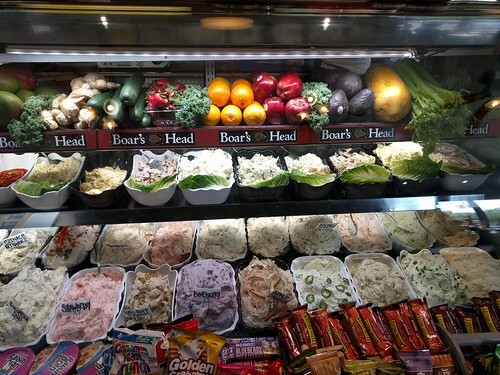 It tasted more normal, though no one needs to drop everything and go there. 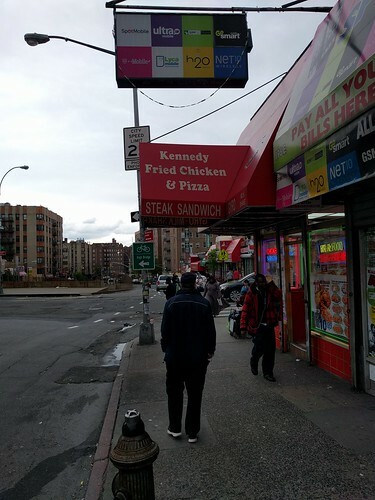 However, the next time I’m in the area I’ll check this place out. We arrived at the end of the 6th inning of game 1 with the Yankees ahead by a run. They immediately lost the lead in the next inning, giving up 3 runs after a pitching change. A cranky fan in front of us provided some colorful entertainment, continuing the rants about the pitching change even after the Yankees scored 6 in the bottom half to take the lead for good. Nice of the team to welcome Derek Jeter and company with a win. 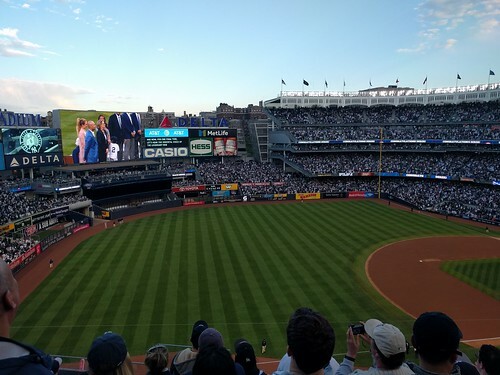 Numerous highlights from Jeter’s career played on the video screen. Part of me wished they also had a mini roast of lowlights, but perhaps that’s inappropriate? I can remember a number of games I attended where he struck out (or worse hit into a double play [higher than the MLB average, especially from 2007 onward]) with the bases loaded. That said, he’s also responsible for 2 of the most memorable plays I’ll probably ever witness in person. The Flip and the first MLB home run hit in November. I certainly didn’t dislike Jeter, but I think I probably rooted more for each of the other 3 members of The Core Four. However, I missed each of their number retirement ceremonies as my short trips back to the East Coast diminished greatly with the birth of my daughter. There are certainly more important things in life than professional sports, especially if you’re not involved in them other than as a fan but I made the decision last year that barring any serious emergency, I would not miss his. If you’ve made it this far, surely you have one question on your mind, how much money did I put on my MetroCard for a day in NYC? There’s a $1 fee to get a new MetroCard (sadly all my previous ones had expired). Each subway ride costs $2.75. 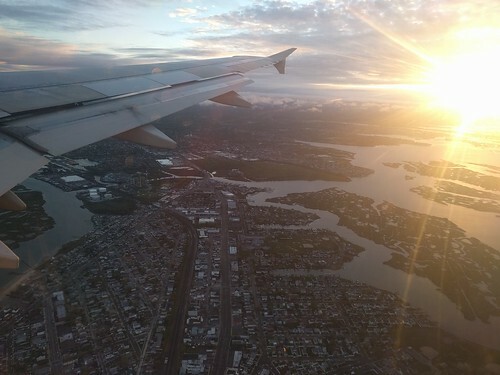 The AirTrain ride from JFK costs $5. One receives a 5% bonus each time one adds at least $5.50 to the card (no bonus on the $1 fee). http://enterprise.mtanyct.info/MetroCardCalculator/ shows how many rides one can get for a given amount of money, as well as various dollar amounts that result in some number of rides leaving the card with a $0.00 balance. It does not compute the minimum amount of money to put on a card if one knows exactly how many rides will be taken. For my trip I estimated 4 rides + 1 AirTrain + 1 new Metrocard so x = 4, y = 1 and I needed to solve for z: (x * 2.75 + 5 * y) / 1.05 + 1 = z. z = 16.2381 However, one can only purchase in increments of $0.05 so solving for z’ = z – (z % 0.05) + 0.05, z’ = $16.25 which would leave me with $0.0125 on the MetroCard. I actually made two purchases (since I did not start thinking about this immediately) the first for $8.50 which yielded a MetroCard worth $7.88 ($8.50 – $1 fee = $7.50, then getting the 5% bonus yielded $7.875 and MTA rounded that up to $7.88. Then I added $7.75, the 5% bonus yields $8.1375 and the MTA rounded up again, giving me $8.14. This left me with $0.02 on my card at the end of the trip…if I had made a single $16.25 transaction, only $0.01 would remain. Using the calculator it appears the MTA rounds to 1 cent when the remainder is >= 0.5, regardless of whether the previous number is even or odd (enter $6.50, $6.65 and $6.70 to see). With a maximum value of $80 for a new pay-per-ride Metrocard, one could make 14 purchases for $5.70 each ($79.80 total) and end up with $83.86 on the card (5.087719298% bonus) vs a single $79.80 purchase resulting in $83.79. If someone thinks of a way to automate and re-distribute cards, they could engage in some https://en.wikipedia.org/wiki/Salami_slicing.